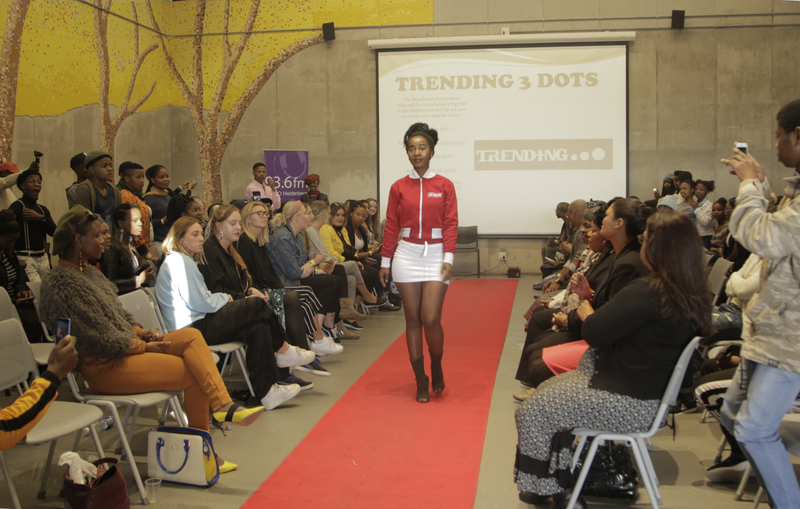 The bi-annual Khayelitsha Fashion Week had the Spring Collection showcase last weekend. A total of 19 local designers displayed their artistry in afrocentric, sporty and trendy looks. Daily Maverick spoke to four designers who shared their journeys getting on to the runway. 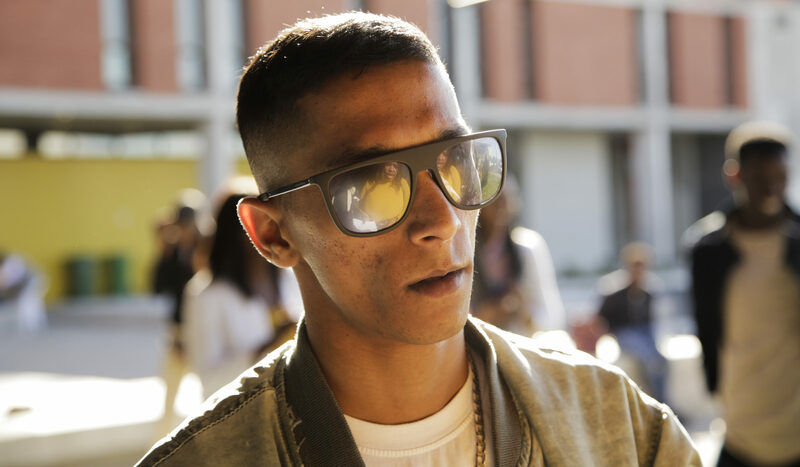 The collection by Apa-che designer Zughdi Mohammed stood out at the Khayelitsha Fashion Week at Isivivana Centre in Khayelitsha last weekend. With its variations in prints from military to dashiki, the eclectic line was eye-catching. What also caught people’s attention was the first model to walk on to the runway, an eight-year-old boy dressed in a military print romper who was wildly cheered on by the audience. Apa-che designer Zughdi Mohammed tries to unite communities through his clothes. Photo: Aphiwe Ngalo, 8 September, 2018. The name Apa-che is a message to the youth to strive for a better future and to gain an interest in fashion and aspire to be designers. The use of different colours, prints and fabrics in his line expressed the different energies and vibrations of South Africans. Mohammed has been a designer for six years. In 2012, he enrolled into the Design Academy of Fashion in Woodstock but had to drop out after only two terms because he could not afford the fees. That did not stop him. Trending 3 dots was one of the audience’s favourites at Fashion week, their street-style/at leisure looks in red, yellow and black appealing to younger audience members. Trending 3 dots is co-owned by cousins Sibabalo Tyasi and Siphokuhle Tyasi. The fashion line was formed in 2016 by the Tyasi cousins who both studied Information Technology (IT), one majoring in computer programming and the other in networking. Trending 3 dots sell their clothes on social media platforms such as Instagram, Facebook and Twitter. The Tyasi cousins sketch the designs and take them to community seamstresses who make them up, and the cousins brand and distribute their clothes to the public. They used their IT knowledge and skills and passion for fashion designing by launching an online store which will be open to the public next month. Nombini Mngqika and her 18-year-old-son Qaqambile Mngqika own Zamagiqwa beads and accessories. The family-run business is named after the family’s clan name, and its intricate beadwork and extravagant headpieces were showcased at fashion week. Mngqika and her son live in Site C Khayelitsha and were showcasing for the second year. They sell their accessories through a bead stand in their community, their Facebook page and they also approach school groups of umxhentso (Xhosa ritual dancing) to get more customers. Zamagiqwa Beads and Accessories also uses recycled products such as bottle caps in their accessories. Their dream is to raise enough money to open their own bead shop. 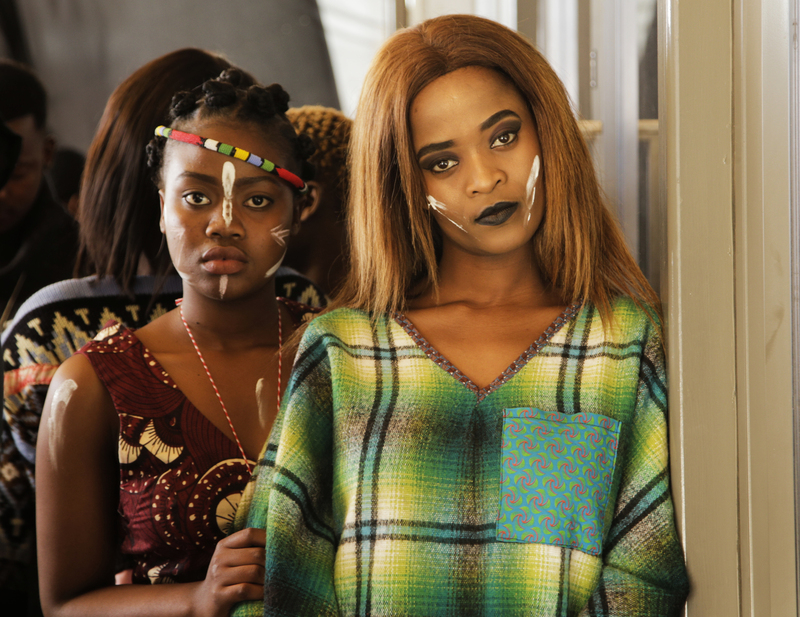 Ubuntu Trends designs crossed gender binaries with male models dressed in prints, skirts and dresses and the women in special blankets traditionally worn by men. The brand started in 2017 when two of the four designers Litha Samsam and Sikelela Kwatsha wore clothes in public that they had designed and styled themselves. 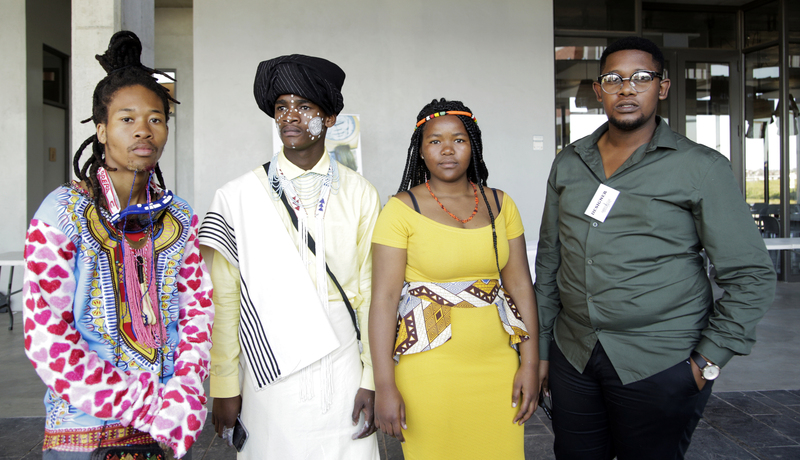 They received compliments and they paired up with two other creatives, Avuyile Ngaleka and Lwakhe Hina. Samsam and Kwatsha design and style the clothes while Ngaleka and Hina help with organising dressmakers, marketing and distribution. 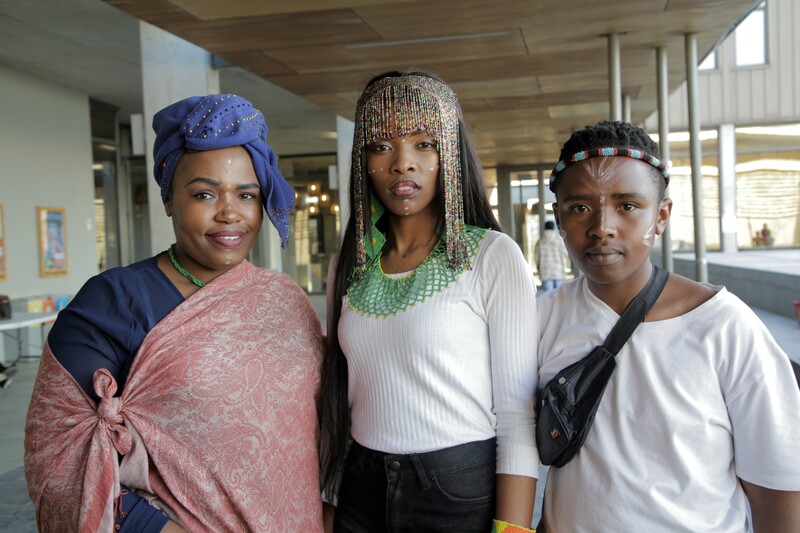 Samsam and Kwatsha auditioned for Idols SA this year, and they were told by judge Somizi Mhlongo that their dress sense reminded him of the legendary Kwaito group Boom Shaka. Mhlongo even said Samsam and Kwatsha reminded him of Lebo Mathosa and Thembi Seete, trendsetters of their time and Boom Shaka group members. The young group of designers’ youngest member is 15, the oldest being 22. They run their workspace in a backyard room in Kwatsha’s home, all coming from the same community in Capricorn, Muizenberg. Ubuntu Trends does not believe in gender binaries and say that their clothes stay as true to the African identity as possible. “We are trying to create our own Guccis. We are trying to prove to people that they don’t need to spend so much money to look good, we are gifted and can make people look good in their true African identity.” Samsam said. Bongani Matenjwa, founder and organiser of the Khayelitsha Fashion Week, said the event happens twice a year with the showcasing of the Winter Collection in April and the Spring/Summer Collection in September. The show is running in its fourth year now with 19 designers showcasing at this Spring Collection. Matenjwa is not a Khayelitsha local, but comes from Bellville but works as a radio DJ at Zibonele FM, the local community radio station. 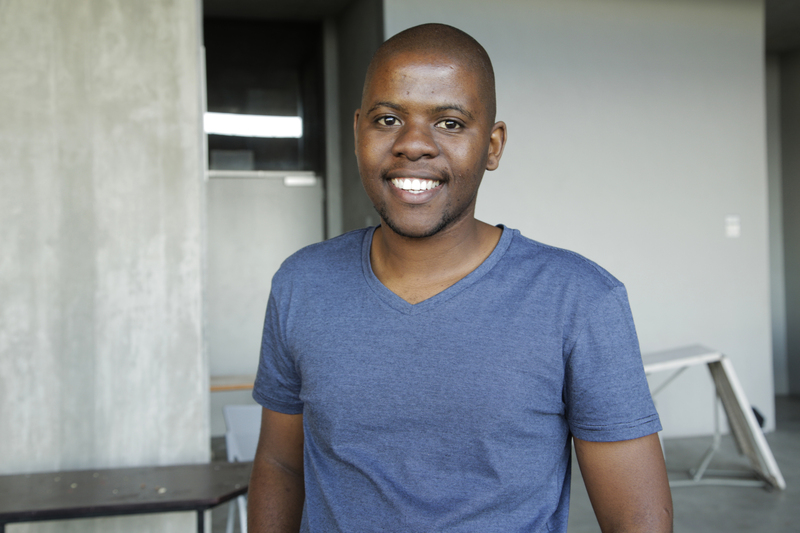 Matenjwa is a second-year student in Operations Management at Cape Peninsula University of Technology.